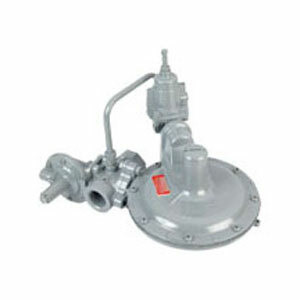 The 1800-CPB2 Series regulator consists of a main regulator and a pilot. It is a pressure loaded regulator, designed to provide stability of operation for precise and constant outlet metering pressure control. Connection sizes ¾", 1″ and ¼". Inlet pressures up to 150 psig (1050 kPa). Outlet pressures range from 1 psig to 30 psig (6.8 to 210 kPa). Capacity is 10,200 Sft³/h (288.9 Sm³/h). Available with overpressure shut-off (1883-CPB2).